Chair lifts restore free mobility and independence to individuals having trouble climbing and descending stairs on their own power. This freedom overcomes a sense of loss and dis-empowerment associated with mobility limitations. Chair lifts transform stairways from limiting obstacles into welcoming and inclusive areas of transport, in the home, public spaces, and office buildings. Whether climbing stairs has become more difficult over time or all of a sudden, losing the ability to comfortably reach all areas of your home often causes frustration, anger, and sadness. Following an injury or other onset of limited mobility, people may struggle with troubling feelings associated with lost independence and change. We cherish our homes and build years of memories within their walls. Moving away because stairways become challenging is not a necessity thanks to a variety of chair lifts available to bring back freedom and comfort. Chair lifts from Indy Stair Lifts restore mobility with options to provide access even to curved or very narrow staircases. If stairs are becoming more and more of an obstacle around the house, our chair lifts are safe and reliable options to regain the comfort and accessibility of your own home. Indy Stair Lifts offers a variety of chair lifts to gracefully overcome challenging interior and exterior stairways. Durable construction and reliable operation will provide safe transport from one level of your home to another. Even during a power outage, charged chair lifts will help you move about your home. We are committed to promoting mobility and freedom to individuals across the country. To this end, we offer great pricing, monthly financing options, veteran discounts, and used chair lifts for sale to accommodate any budget. Our customers gain the benefit of our industry leading warranty and dedicated customer service. Professional installation ensures the proper performance of our durable chair lifts for years to come. Chair lifts can install to fit small or complicated stairways, and the seat and footrest can fold up for convenience to save space when not in use. In addition to residential chair lifts, we supply commercial chair lifts for schools, office buildings, and other locations to improve public access. Employees, customers, and associates will appreciate the opportunity to move about a building with ease and dignity. Mobility limitations must be addressed in buildings and landscapes with stairs to minimize undue struggle and effort and provide welcome access to all. 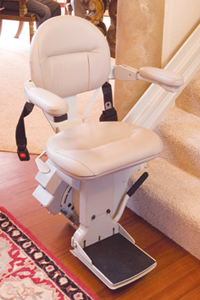 Indy Stair Lifts chair lifts accomplish this aim with safety and style.